But can it be done within NASA's tightened budget? Artist's illustration of NASA's Space Launch System megarocket launching the Orion crew capsule. 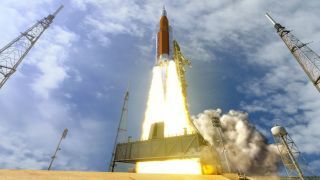 NASA Administrator Jim Bridenstine said Wednesday (March 27) that speeding up production of NASA's Space Launch System (SLS) megarocket is absolutely essential to getting humans to the moon by 2024. Bridenstine emphasized this point in a statement about U.S. Vice President Mike Pence's call Tuesday (March 26) to meet that goal, and the administrator discussed it in more depth yesterday at a U.S. House of Representatives hearing on NASA's budget request for 2020. That budget request delayed work on upgrades to the megarocket, whose first version is still under construction, and moved some of the SLS's prospective payloads to other spacecraft. During a recent Senate hearing, Bridenstine had also mentioned the possibility of launching the Orion crew capsule on a private booster, so multiple questions at the House hearing concentrated on reconciling these statements. "If we're going to have boots on the moon by 2024, as the vice president indicated yesterday [was a goal], which I believe we can achieve, we're going to need SLS. We're going to need to accelerate it and get as many of those [technologies ready] as soon as possible, and we're going to need Exploration Upper Stage [EUS] as soon as possible," Bridenstine said during the hearing yesterday, referring to the advanced second stage that will allow SLS to carry larger payloads. The EUS does not receive funding in the current budget request. Bridenstine went into more detail about how the agency planned to meet the vice president's deadline and to aim for a June 2020 first launch of SLS. However, he said he didn't think that exact launch date was "in the cards." Nonetheless, he said, SLS is essential to getting Orion flying as soon as possible. "I did make the statement before the Senate a few weeks ago that we need to look at all options to maintain [the] schedule," Bridenstine said. "We did look at those commercial options, as you identified. We came to a determination that while some of those options are feasible, none of those options … are going to keep us within budget and on schedule." Bridenstine added that the agency is doing a 45-day study about the best ways to pick up the pace on SLS without increasing cost. That study should produce results within a few weeks. He said NASA had purchased hardware to help integrate the rocket horizontally rather than vertically. This would allow for more of the rocket to be constructed without waiting for the engine section, which has proven to be more challenging to build than expected. He also discussed the possibility of shortening the engine-testing phase. Because SLS's RS-25 engines, which also propelled space shuttle launches, have already been used extensively, NASA may be able to intensively test them individually rather than performing a big test that combines all of them. A test of all four, called a green run test, would add several months to the SLS preparation time. "The key is to test in a way that we know that we optimize the success of the first launch. That has got to be the goal," Bridenstine said. "When we talk about a green run test, we're talking about basically building the core stage of the rocket with all four engines, all at the same time, and running the whole rocket, minus the side boosters that are solids … for a period of 8 minutes. The question is, is that necessary? "And could we test each engine individually at very high off-nominal conditions to get certainty, or at least eliminate either as much risk or almost as much risk as we would do if we were in the full green run?" he continued. "That could save six months of schedule, depending on how we do it." House representatives questioned Bridenstine about the pace of SLS flights after Exploration Mission-1, the first, uncrewed launch of Orion, and Exploration Mission-2, which will have astronauts onboard and is targeted for 2022. He said that after those two launches, NASA would have to get into an operations tempo with SLS, possibly ramping up from one launch per year to one per six months. This would reduce the cost of each launch and would be necessary to get everything in place for human missions to the moon. He added that in light of that, NASA may need to make a change to another mission. Although Congress has pinned an uncrewed mission to Jupiter's moon Europa to ride on SLS, it may be worth sending that mission on a commercial rocket, traveling more slowly, to reserve SLS for the moon work, Bridenstine said. When asked about this year's budget cuts, Bridenstine was firm that everything could be accomplished without going over budget. But the questioning about the specific pieces that would be necessary made clear that the budget may need to be reconsidered, at least for future years. "2024 is a very aggressive schedule, and there is nothing that we can do to accelerate that in a more meaningful way, to get boots on the moon in 2024, than having Exploration Upper Stage and the Orion crew capsule, the European Service Module [which attaches to Orion] and the Space Launch System," Bridenstine said in response to a question by Congressman Charlie Crist, D-Fla. "And with the Exploration Upper Stage, we'll need that second mobile launcher" at Kennedy Space Center. "So, I assume this all means that we will need more funding in order to accomplish those goals?" Crist asked. "Yes," Bridenstine said. And they were on to the next topic.